Bean sprouts, which are the edible offshoots of beans, are frequently used as a salad ingredient and a topping in sandwiches. They are highly nutritious, an excellent source of fiber, and high in both folate and vitamin C. Generally bean sprouts are eaten raw, but because raw sprouts have been linked to bacterial contamination, it is a wise idea to cook your sprouts before serving. Saute your bean sprouts to keep them crispy. Purchase only fresh, crisp bean sprouts. 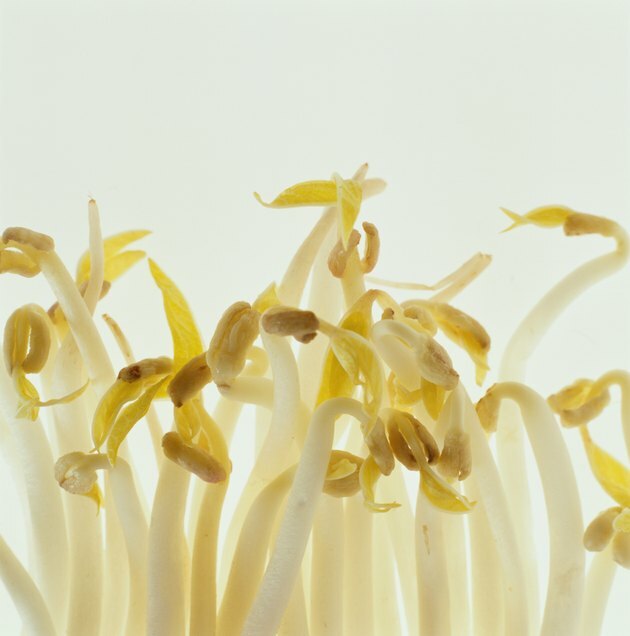 Slimy, mushy, or stringy bean sprouts are likely wilted or contaminated by bacteria. Rinse sprouts thoroughly under cold water before cooking. Discard any parts of the shoots that are brown or yellowed. Fill the bottom of your saute pan with oil, fat, butter or stock, depending on the dish you are preparing. Heat the pan to a high heat. Place the sprouts in the pan. Stir or toss the sprouts frequently to prevent burning. Remove the sprouts after a few minutes to maintain their crispiness, and serve.